In thinking about Health Information Professional (HIP) Week, I found myself thinking of how I have interacted with HIM professionals over my years in healthcare. I started working in the hospital in the ‘80s as a candy striper (yes, I wore the red and white striped jumper). I often worked as the runner between the ED and medical records department. I would run down and obtain the old records so that the caregivers could review the patient’s history. Little did I know that EHRs would replace that function. No more emergency runs to the basement to deliver charts. When I worked in patient care, I was often the one calling for the delivery of those past medical records. I was always amazed as to how quickly the HIM department would get those records in my hands and how well organized the information was. While working in the role of education and quality improvement, I performed record reviews related to several quality initiatives. I’d go to the HIM office and find myself overwhelmed with the sheer volume of the records and the fact that I could ask for a record and it would miraculously arrive in my hands. I was always impressed with the organization and commitment to confidentiality that the staff provided related to maintenance of the record. The HIM staff was always helpful and professional. It wasn’t until I began working as a CDI specialist that I began to better understand the HIM and coding team. I was immediately impressed with their knowledge and ability to understand and synthesize all the information within a medical record. In that HIM department, the one where I first worked in CDI, they were the staff who really taught me how to perform my new job role. They mentored me, interpreted guidelines for me, coached me. We worked as a team. I would not be where I am now if they had not been so generous with their time and experience. Just as the profession of CDI is changing and expanding its reach, so has HIM management. We are learning how very important documentation and claims data are in our ever-changing world. The focus of this year’s HIP Week—“driven by health data”—identifies that rapid change. These professionals are not only the keepers of the data, but they work to ensure the data is accurate and relevant. We work together to make that happen. Once a year, we intentionally honor HIM professionals. Just as I thank those coding professionals who helped get those records in my hands when we emergently needed to confirm a patient’s history, and those who held my hands as I tried to decipher the meaning of the Official Guidelines for Coding and Reporting, I thank those who presently work in the many different roles that preserve and protect our healthcare data. 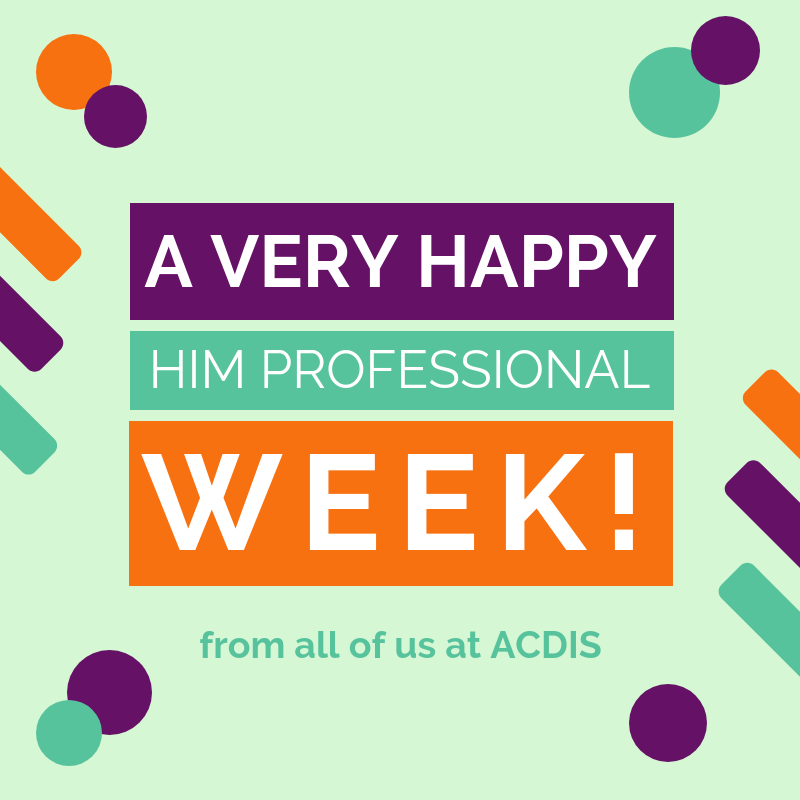 Take some time this week to recognize the HIM professionals in your world and let them know you couldn’t do your job without them. Editor’s note: Prescott is the CDI education director at HCPro in Middleton, Massachusetts. Contact her at lprescott@hcpro.com. For information regarding CDI Boot Camps, click here.